Jeff is an author, speaker and organizational designer. 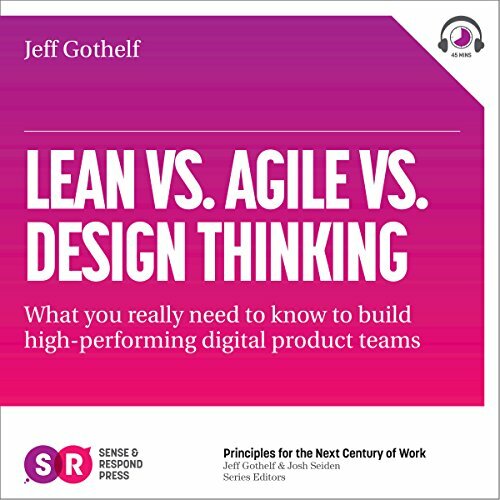 He is the co-author of Lean UX (O'Reilly 2013) and of the upcoming Harvard Business book Sense and Respond Over his nearly 20 years in digital products and services Jeff has worked to bring a customer-centric, evidence-based approach to product strategy, design and leadership. Jeff has worked in various roles and leadership positions at iXL, Fidelity, AOL, WebTrends, and TheLadders. Most recently Jeff co-founded Neo Innovation (recently sold to Pivotal Labs) in New York City and helped build it into one of the most recognized brands in modern product strategy, development and design. As a principal in Neo's NYC office, Jeff functioned as head of executive training, coaching, workshops and education. Jeff is a lean thinking and design evangelist, spreading the gospel of continuous organizational learning, great team collaboration, product innovation and evidence-based decision making. Jeff is a speaker and thought leader on the future of organizational management in a software-driven world focusing on product development and design. Jeff is regularly keynoting conferences, teaching workshops or working directly with client leadership teams across North America, Europe & Asia.